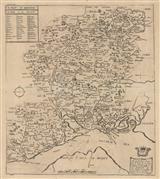 Description: County map of Hampshire with an inset of Winchester. Superb impression of the first edition of Speed's seminal county map. Description: Hampshire. Beautiful Dutch Golden Age map of the county, embellished with decorative cartouches and illustrations. Original Colour. 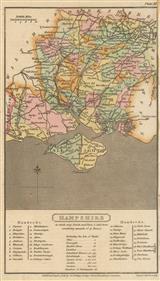 Description: Attractive and rare map of Hampshire with a panel naming its Hundreds on the upper left. Description: Grand map of Hampshire with informative and descriptive text. Cartouche highlights the importance of trade to the county. Original colour. Description: County map highlighting the extensive road network in the county. Coloured. Description: Attractive map of the county of Hampshire highlighting the developing road network during the Industrial Revolution. Original hand colour. 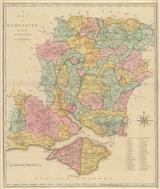 Description: Hampshire, a detailed and attractive county map published in the early 19th Century. Original colour. 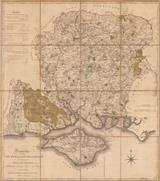 Description: Large map of Hampshire elegantly engraved by the brothers Christopher and James Greenwood. Vignette of Winchester Cathedral. Original colour. 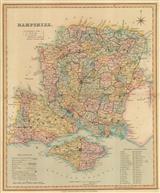 Description: Late Georgian county map of Hampshire and the Isle of Wight with particular emphasis on mail coach routes as well as showing Turnpike Roads and canals. Original hand colour. Description: Attractive folding map of Hampshire with an emphasis on the political aspect of the county outlining the borough borders and listing the number of MPs it returns to Parliament. Original colour. Folded. 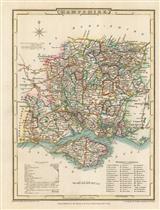 Description: Charming county map of Hampshire with reference to the hundreds and liberties. View of Southampton in the vignette to the lower right. Coloured. 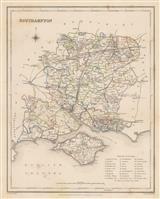 Description: Charming map of Portsmouth and environs, including Gosport, Fareham, and Havant. Coloured. Description: Hampshire and the Isle of Wight. County map with key and reference to the unions. Original colour. 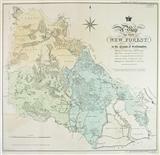 Description: Map in original colour produced by Parliament to show the extent of the New Forest.